Ultimately, it isn’t an overly awful site. There’s even a honey milkshake recipe that I plan to make in the hope of having a proustian flash-back to 2000 when I was at university and drank nothing but Jamie Oliver honey milkshakes. It was either that, or Orange Hooch, Mad Dog 20/20 and Metz, I can’t remember now. That said, the one thing which is truly awful is the splash page. It’s the most piss-poor animation. You can see it here. To prove just how rubbish it is, I took a pen, some paper, my camera and made a stop motion version in 5 minutes flat. 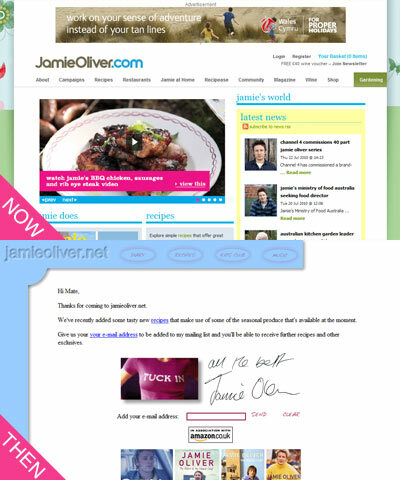 This entry was posted on July 26, 2010 at 11:06 am	and is filed under Jamie Oliver. You can follow any responses to this entry through the RSS 2.0 feed. You can leave a response, or trackback from your own site.